New Right chairman addresses ongoing counting of soldiers' votes, as his party hovers around the electoral threshold. 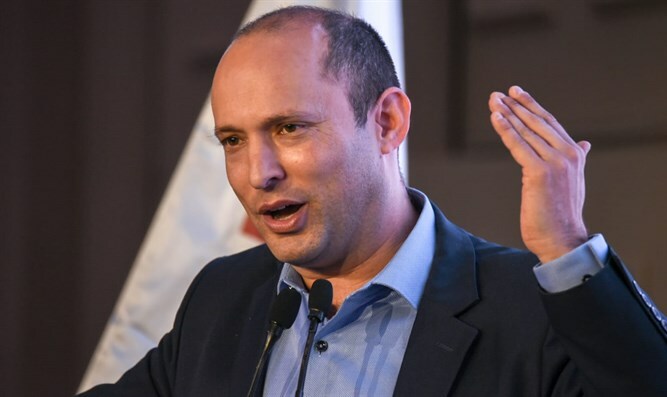 The head of the New Right party, Education Minister Naftali Bennett, said Thursday while leaving his home in Ra'anana: "I am praying to G-d and fighting for every vote." A member of the Central Elections Committee, Avraham Weber, said on Galei Tzahal radio: "The electoral threshold has increased, so the New Right apparently does not pass due to a shortage of 1,000 votes." The counting of votes is ongoing and the final results are expected to be published later Thursday. If Bennett and Shaked pass the electoral threshold, they are expected to join forces with the United Right to make a group of 8 MKs for coalition negotiations, and it is estimated that only one of the two New Right leaders will serve as minister. The right-wing camp gets 67 seats, the left and Arab camp 53. On Wednesday, Bennett said, "We need about 5 percent of the soldiers' votes, compared to the 3 percent we had nationally. It is possible but borderline. It can succeed or fail on the basis of [only] dozens of votes one way or the other."